The science-fiction film features expensive special effects instead of up-tempo dance numbers. Bollywood is the collective term for movies released in the Indian market and the style usually veers toward romantic comedies or dramas with lots of dancing and sitar-playing. 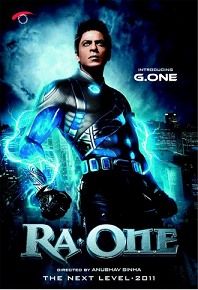 The Bollywood style has evolved beyond the stereotypical musical of late and this weekend marked perhaps the largest departure with the debut of Ra.One, a science-fiction film with superhero and videogame themes. Ra.One grossed 1.7 billion rupees worldwide - which translates to $35 million - in the first five days it's been out, propelled by the star-power of Bollywood dreamboat Shah Rukh Khan. According to the film's distributor Eros International, Ra.One broke the record for a debut on the Indian holiday of Diwali, as well as a single day sales record grossing 360 million rupees last Thursday. With good reviews in U.S. publications, the film is expected to sell well to Indian audiences and perhaps break into the mainstream English market. It's a good thing the film is selling tickets, because many claim it is the most expensive Indian movie production with its 1.5 billion rupee budget second only to the Tamil science-fiction film Enthiran. The plot of Ra.One sounds like a mashup of Lawnmower Man, TRON and Virtuosity. A company called Barron Industries introduces a new technology which somehow blends what happens in a computer with real life. The same company is then tasked with creating a videogame using this technology, and in order to make the game more difficult, complex A.I. is used to allow the game code to learn new strategies on its own. You can guess what happens next, as the villain called Ra.One makes the leap into the real world and the only way to defeat him is for the hero played by Shah Rukh Khan named G.One to make the same leap to protect the city. There's a lot more to it than that, obviously, but the trailer actually looks entertaining. Even with subttitles, I would totally watch a sci-fi action movie like Ra.One. Now, if only it was playing in my area.